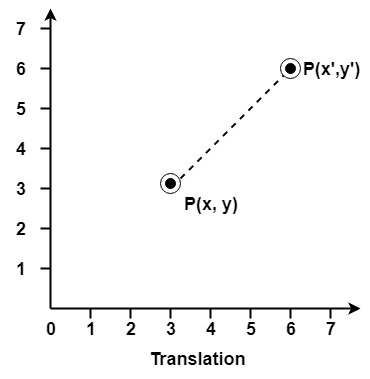 It is the straight line movement of an object from one position to another is called Translation. Here the object is positioned from one coordinate location to another. To translate a point from coordinate position (x, y) to another (x1 y1), we add algebraically the translation distances Tx and Ty to original coordinate. The translation pair (Tx,Ty) is called as shift vector. Translation is a movement of objects without deformation. Every position or point is translated by the same amount. When the straight line is translated, then it will be drawn using endpoints. 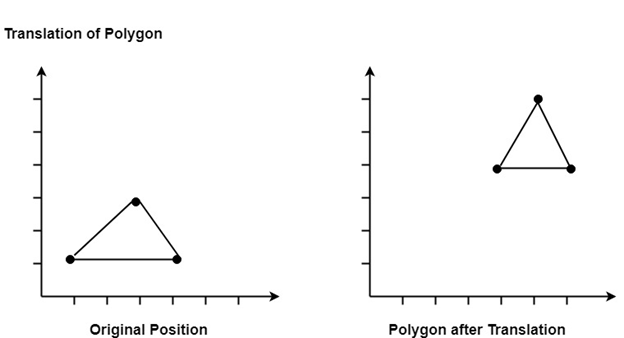 For translating polygon, each vertex of the polygon is converted to a new position. Similarly, curved objects are translated. To change the position of the circle or ellipse its center coordinates are transformed, then the object is drawn using new coordinates. Let P is a point with coordinates (x, y). It will be translated as (x1 y1).